This time of year is all about planning what we are going to grow this season and working out what will go where. But it’s also good to go up to the allotment and see what has overwintered well. 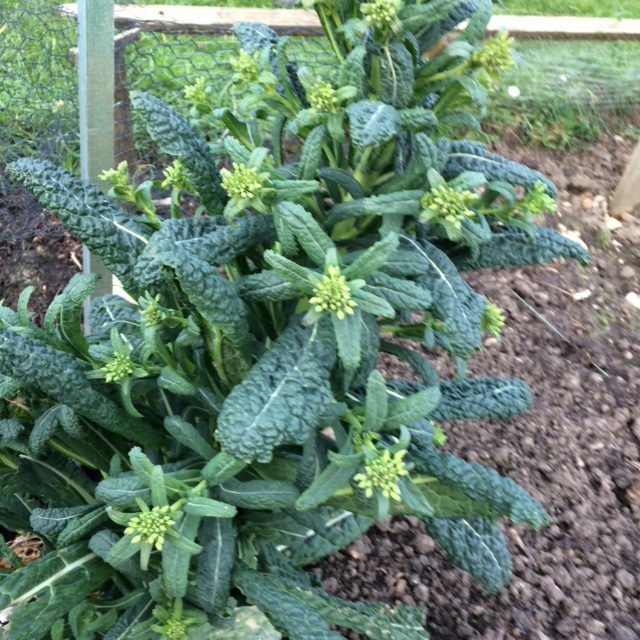 After a holiday in late February our first visit up to the allotment on our return saw the Cavelo Nero kale going to seed (see photo) but what I discovered a few years ago, much to my delight, was these new shoots are a good substitute for purple sprouting broccoli. I soon returned with a colander and picked enough for a meal. I will continue picking until the shoots are over then I will pick the rest of the kale leaves to use in juices, soups and for kale crisps. The plants can then come up and the land can be prepared for its future crop. Before any bad weather we covered the chard, land cress and parsley with glass. These have continued to grow over the winter and are all ready for picking. The mint and rhubarb are shooting well and it won’t be long before I can pick jugs of mint to keep near the kettle and use for fresh mint tea. Before we went away I also planted a few seeds in the back garden. Planted in plastic rings (old water bottles) and covered with glass, there is always a chance that there will be little plants growing when we return. It all depends on the weather, but this year the record breaking temperatures means that we now have little plants of lettuce, rocket, beetroot and coriander to go out in the garden. I will still cover the seedlings with glass as a frosty night would soon kill them off but hopefully we will be eating our first lettuce leaves in another month. It’s a busy but exciting time and I’m so grateful that my husband forced himself out in the cold in January to prepare the ground. It means that apart from a little weeding and feeding we are ready to go.